We are asked many times throughout our days, "How are you doing? Still holding up? How are the girls?". Our reply still remains the same "As good as can be expected for the situation. I don't know how people can do this without Christ to walk with. We have an overwhelming peace." I can honestly say this is the truth. This isn't something we say just to 'get through' the conversation. There are two choices that can be made....crawl into a black hole and die in your own pity, or count your blessings God has given you and give him the Glory. The blessing may sometimes be small or even not what you expected, but they are blessings none the less for God is Good. We as Christan's need to be always looking for the blessings in our lives (even if we think we don't have any) and when we find them (I know they are there) we need to bring Praise to God in all situations. To answer the question of the how the girls are doing, very well. As Jerr i shared earlier, their faith and understanding are amazing. 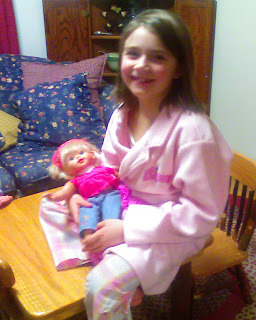 Kylei is a very good big sister and since the passing of Baby Brother, she has latched onto her baby doll, Kaya. She cares for her like a big sister cares for her baby sister ....changing her diaper, feeding her, and tucking her in bed at night. 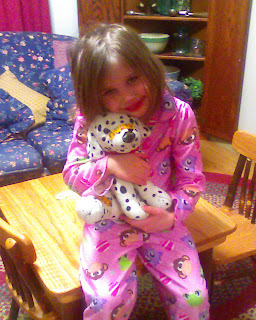 Kadenn is a great big sister also and she has her puppy, Buddy. You might recognize him from earlier when the girls visited us in the hospital. Buddy was Baby Todd's stuffed animal that Kadenn bandaged up with the medical supplies they were given by the patient care provider. We gave him back to her when we explained to her about Baby Brother going to heaven. He goes everywhere with her and he still has most of his bandages. When she missed her brother, she gives Buddy big hugs and says she loves him. We love to watch our girls with their ways caring out the big sister role. "Dear Lord, protect my childern and give them ever lasting faith throughout their journey of life, Amen"
Thanks for the photo's of the girls & leaving us know how you are all doing. Those girls are special to us, Thank's Jerri & Dustin. We are praying for you, & love you all so much. "2He called a little child and had him stand among them. 3And he said: 'I tell you the truth, unless you change and become like little children, you will never enter the kingdom of heaven. 4Therefore, whoever humbles himself like this child is the greatest in the kingdom of heaven.'" What a beautiful picture of faith you have right before your eyes! How powerful it is that you walk with the girls too through this. Keep walking with Jesus and have your girls walk with you. Praying for you. How wonderful it is that the girls have a way to express their big sister love and care for Baby Todd through caring for Kaya and Buddy. You're girls are truly precious! I appreciate your challenge to keep finding blessings in the midst of life's challenges. It is so true but so easily forgotten in the moment. Blessings! From the very beginning your blog has touched my heart! The pain, the faith, and love can be seen so clearly. Again I say, you are an inspiration to all who know you! God chose your family to bless with Todds very short life, and very BIG testimony!! I am still praying for your family! May God Bless and Comfort you! Hello Dear Friends! I wish you knew how much Joy you bring to my day!! Words really can't express! I hope these words which are from my heart will bring a little joy to your day as well! I was thinking about your quote, "always be looking for blessings"... The first that comes to mind is Christ! What a blessing it is to have the security in knowing that we have eternal life with Him!! When my day seems tough, by sister asks me, " Annie, isn't it enough just to know He came to die for our sins, and to give us eternal life?" I always respond with a 'yes'! It is good to be reminded of His promise, for this is not our home! And we can get so caught up in the frivolous things of life! Another great blessing, is your family! I have been blessed by the words and actions you've shown through this journey. Baby's Journey Home! What an amazing Title! That was a God thing! God is so PERFECT! And though we may never understand, we thank Him for His healing and comfort through all of this! I praise Him and ask Him to fill your arms with love to take away the ache, give you wisdom beyond your years, and to be able to continue glorifying Him in ALL of this!Dustin & Jerri, you have been such an inspiration & Godly examples. May you be richly blessed for the blessing you have been to us! WE love you! Thanks Dustin and Jerri for sharing this blog. Your little ladies are so dear and have been a blessing to us. Maggie (and the Possinger family) continue to pray for all of you. Married to my best friend and biggest fan! Momma to three amazing little girls. Writing about our crazy journey through life and grief, while loving Jesus in the midst of tragedy.